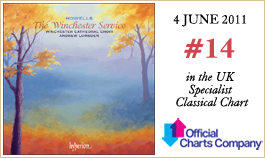 The Choir of Winchester Cathedral is recognised as one of Britain's leading Cathedral choirs. Their principal function is the singing of services in Winchester Cathedral, and, during term time, they sing an average of eight services each week. In addition they give concerts both in the Cathedral and elsewhere in Britain. They have also toured the USA, Australia and Brazil as well as most European countries. They are regular broadcasters on radio and television. Their repertoire ranges from music in the Winchester Troper (dating from c1000 AD) to many contemporary composers. Winchester Cathedral has also been at the forefront of commissioning new works from composers such as John Tavener, Jonathan Harvey, James Macmillan and Tarik O’Regan. 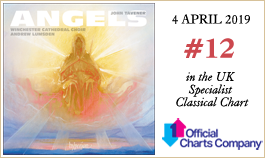 Their many recordings for Hyperion, Virgin Classics and Decca include discs of English music by Purcell, Tye, Tallis, Stanford, and Elgar. Other recordings for Herald and Regent include collections of music for Advent, Christmas and Epiphany. The Choir comprises eighteen boy choristers and twelve permanent lay clerks. The choristers are educated at The Pilgrims' School where they all learn at least one instrument, and the majority of them gain music scholarships to their next school. The lay clerks are all experienced musicians who work in a wide variety of professions, including teaching, PR and administration. The Cathedral also runs a girls’ choir (who are aged from 12-17) who sing services and concerts both by themselves and with the boys and Lay Clerks.